Ladda Aharn, or Pink, as her friends call her, smiles as she welcomes the group of tour operators to her village on the Andaman Coast. Unlike the majority of visitors over the past few years, this group of visitors is not here to see the destruction wrought by the tsunami of 2004. Instead, they are here as tourists to enjoy the cultural and natural splendor of Ban Talae Nok, a village of 67 homes situated in between the coral reefs and dense rainforests of Southern Thailand. Life has not always been so easy for Pink -- the majority of her village was destroyed in the tsunami, and, due to declining fish stocks and mangrove destruction, she was unable to return to her traditional fishing lifestyle. With the development of community tourism, however, her luck is turning around. “We are beginning to understand how to connect tourism with our way of life, and share with people the natural environment that we depend on for our culture and livelihood,” Pink explains. Since rebuilding their lives after the tsunami, some villagers in rural Thailand are using tourism as a tool for sustainable development. Community members such as Cha now offer homestays, eco-tours, and other activities -- allowing visitors to participate in the traditional way of life that so often eludes the casual tourist. Their work has been assisted by the North Andaman Community Tourism Network. Under the sponsorship of IUCN, the network is serving as a bridge between local villages and the private sector. In the last two years, community tourism has generated over $20,000 USD income for villagers, while also generating funds to a children’s center, mangrove conservation, and other community development projects. Last weekend I went to Koh Ra Ecolodge, which I've determined is a fantastic way to live. I would be a happy person living and looking after an ecolodge, it's very mellow. Kim, the very nice gentleman who runs Koh Ra, was a formidable host. His staff prepared the most scrum-trellescent meals. He showed me around the grounds, which includes a composting system, nature trails, and the most amazing bungalows. To the right you see Kim holding up a star fish used to fertilizer the nearby orchards. We went for a short nature hike on Saturday. Our goal was to find as many species of orchids that we could. They were beautiful! We counted 12 species of flowering orchid overall. But the surprising part of our hunt were the strange bugs we ended up finding. This little cricket was the brightest color pink I have ever seen in nature...apart from this flower to the left. On Sunday morning we began our hike at around 7am. It turned into a 7-hour journey that took us through jungle, beach, mangrove, and clear-cut forest. We saw several horn bills within the first few minutes, walking through the savanna. We visited a Moken village, the Thai sea gypsies. They talked with us while we sat on their porch in the hot sun. In the picture to the right, you can see the mangroves to the right of me, with the mainland in the background. We sate at a little fishing house here for a few minutes and sucked the juice from some ripe cashew fruits. You can't eat the nuts because their oil will burn your skin, but the fruits are extremely delicious and taste like strawberries! 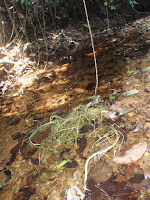 We then journeyed on towards a jungle stream. There were vines extending from the canopy down to the water. The feelers that spread out in the water looked exactly like the feather-like appendages in Avatar! It was amazingly cool and calm in the jungle. Huge freshwater shrimp peeked out from behind rocks, and schools of tiny fish filled the water. We took a dip in the fresh water and then started our journey home. We walked along the beach, stepping on the elbow roots of the mangroves. The jelly fish to the right followed us for a bit. We waided through the incoming tide, away from the Moken village, and back toward Koh Ra Ecolodge. Kuraburi. This was the leader of the pack, looking into the sunset and contemplating life. To the left is the group: Erik, Awe, Kim, me, and Bodhi. sun set as we boarded our longtail boat for the mainland. I came home sleepy and ready for the work week, with a true taste of sustainable ecotourism. *special thanks to Bodhi for the photos! MAP, in partnership with Naucrates, have established a Coastal Community Resource Center (CCRC) in Ban Lion Village on Phra Thong Island. Take a moment to read their special appeal, and if you can, please consider donating or helping to spread the word. The effectiveness of Andaman Discoveries requires cooperation from many partners at the grassroots level, including the communities, NGOs, and sustainable enterprises. Two organizations that have been essential to conservation successes in this remarkable area of Thailand are the Mangrove Action Project (MAP) and Naucrates Sea Turtle Conservation. These organizations need your support to help preserve the extraordinary biodiversity found within coastal ecosystems of the North Andaman region of Thailand. This area is increasingly threatened by unsustainable natural resource exploitation and development, the impacts of which not only affect the unique natural flora and fauna of the area, but the local fishing communities as well. A very real need exists for increased environmental awareness and education at the local level to create and secure sustainable livelihoods. Wilasinee “Clang” Klatalae dreams of completing her university degree in tourism management. “It’s my goal to communicate with foreigners from different cultures. I love nature, meeting people, and to travel and share experiences,” she said during her recent long-term scholarship interview. Andaman Discoveries needs your help to ensure Clang and the 130 students like her can continue receiving scholarships. Please consider helping us fund this valuable program. Donors can sponsor a student for about 15,000 Thai Baht (about $450) per year to cover educational expenses, and will receive updates regarding their sponsored youth’s academic performance as well as a personal letter. The scholarship program provides financial support for students in primary school through university for a total of seven years, ensuring these students will have access to an education and the funds to cover textbooks and materials. “My life is getting better -- I’m very delighted to receive this scholarship because this make my dream come true,” said Clang. Andaman Discoveries was one of twelve finalists (out of a record 900 nominations) for the fifth annual BBC World Challenge awards. We appealed to you to help support our nomination by voting for us online, and are extremely grateful for the tremendous outpouring of support we received. The time and energy you consistently show us is a source of hope and inspiration – to say nothing of our very existence – and we offer our gratitude. The experience garnered tremendous positive exposure for us, helping to spread our message to a much wider audience. We were humbled by this honor, especially considering the formidable talent competing for this award. Please join Andaman Discoveries in congratulating this year’s winner, the Safe Bottle Lamp Foundation of Sri Lanka. It was the belief of Thomas Jefferson that every generation needs a new revolution, and for the past year Youth in Action for Next Generations (YNG) strived to make sustainability a key issue for the next one. This global project, organized by Pistes-Solidaires, actively united young people from both developed and developing countries in sustainable development projects. In Thailand, Andaman Discoveries collaborated with Mangrove Action Project (MAP) and the International Union for Conservation of Nature (IUCN) to create a network of ten youth groups in the North Andaman region. Andaman Discoveries hosted the final meeting in November 2009, which summarized the various outcomes and was attended by NGOs from the eight participating countries. “The project helped strengthen and broaden networking and participation amongst the youth along the North Andaman Coast,” said Jaruwan “Ning” Kaewmahanin of MAP. The group reflected on their environmental and natural resource management experiences and community development project implementation. Jagriti is a community-based organization empowering poor, disadvantaged hill women in India through the sale of locally-produced herbal and organic goods. Mimi Chueng of Andaman Discoveries met force behind the venture (and fellow 2008 SEED Award winner), Mamta Chandarat, at the United Nations Commission for Sustainable Development (UNCSD) in New York last June. “We strive to improve livelihoods by increasing social, environmental, and economic sustainability,” said Mamta of her project. Seeing the obvious parallels between her work and that of the Ban Talae Nok women’s soap group, she visited Andaman Discoveries in November to see the operation firsthand and share her advice. “Mamta is an expert in handicrafts, and gave us many ideas to improve our process,” said Ladda "Pink" Aharn of Ban Talae Nok. Mamta also participated in a village homestay, where she fell in love with the people, natural surroundings, and especially the food. The Ban Talae Nok soap cooperative is making substantial progress in domestic marketing, garnering increasing interest from hotels and crafts shops in Bangkok, Khao Lak, and Phuket. “Now we can be more efficient, and this will benefit the village,” added Pink. Andaman Discoveries gratefully acknowledges SEED for sponsoring Mamta’s visit.